Aggregate Metering – NEMV vs. NEMA. NEMV & NEMA (Virtual Net Energy Metering & Aggregate Net Energy Metering) are similar methods of expanding the power production credits into offsetting the utility usage of several accounts (held by the same customer). The term NEM is generally used in the context of a single renewable energy system back-feeding power into the utility grid through a meter and crediting the account associated with that meter. 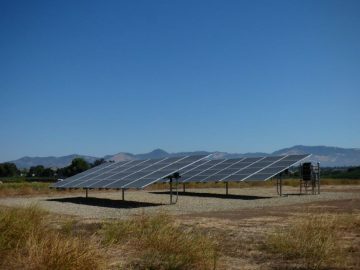 Net Energy Metering Aggregation (NEMA) allows a single customer with multiple meters on the same property, or on adjacent or contiguous properties, to use renewable generation to serve the aggregated load behind all eligible meters and receive the benefits of Net Energy Metering (NEM). The generating meter may have a load behind it. All accounts must be under the same name and additional renewable systems can be located on the same property, but only one meter group per NEMA account. Virtual Net Energy Metering Aggregation (NEMV) allows a single customer with multiple meters on the same property, to use renewable generation to serve the aggregated load behind all eligible meters and receive the benefits of Net Energy Metering (NEM). The NEMV meter can not have any load behind it – metering only the renewable energy output. There can not be any additional renewable energy inputs to aggregated meters and all meters must be at a single point of service (line drop from the utility). A difference between NEMV and NEMA is the ability to control the allocation of the power – NEMV allows you to decide how much power is allocated to each aggregate account (this allocation may be changed once per year). Under NEMV you may allocate the power not only on the predicted loads, but more importantly you may allocate on the predicted cost – so a low cost meter may be allocated a lower percentage of power than a high cost account (an example would be if an account cost skyrocketed as the higher priced tiers were crossed – having power allocated based on cost vs. on usage can be a much more advantageous scenario). NEMA is a set percentage of usage allocation that is calculated by PG&E – you abdicate control over where the power is allocated to PG&E which could prove to be costly in a situation of high tier usage on one account. Also – NEMV is the only account that allows you to receive some compensation from PG&E for excess production (won’t make you rich – it is only ~ 3 cents kWh). Both rates have their advantages and disadvantages – While you must pay attention to the energy allocation, ultimately having control over that allocation through a NEMV account can be advantageous. Utility rate schedules change – please contact Pacific Energy Company for the latest information and send us your multiple meter electric utility bills. We will check current tariffs and calculate the savings you can achieve with an aggregate metering system.